This is because to want is to lack. Whether you are for or against something, you are attached to it in some way. The path of zen is to be neutral — neither wanting or not wanting — rather accepting and at peace. This is a state of abundance in which all things needed come your way. When you do not want or need, then you are complete. And completeness begets more completeness. 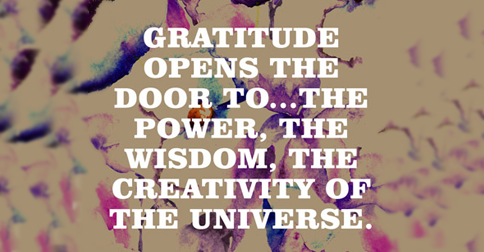 Gratitude can be a very powerful path to this state. Gratitude, combined with a deep level of acceptance and appreciation, is indeed unstoppable. Disallowing ourselves to receive is actually a form of narcissism. Rather than receive gracefully, thereby signaling to the giver that their kindness touched us in some way, we divert our eyes, shut down, or dismiss it. We’re consumed by the self-consciousness of shame (that we’re not worthy or deserving) or fear (that we have a big ego or we’ll be obligated to give back in some way). Our self-referential thoughts, fears, and insecurities keep us preoccupied in a world that does not allow an easy flow of giving and receiving.